KPU creative writing professor Nicola Harwood has created a safe space to feel and interact with artwork based on violence against women. Her project, Summoning (No Words), is an interactive and immersive installation created by recordings of the female voice. Summoning (No Words) premiered last August at the Oxygen Art Centre in Nelson, B.C. The sound design, curated by Harwood, was composed by seven female vocalists that reflected issues of violence against women. Because Harwood didn’t want the vocal artists to speak in the recording, the only discernible language that can be heard in the piece is through whispers. “I didn’t really want to make work that just sat there on the wall,” Harwood explains. Instead, she created the interactive soundscape with the help of two KPU students, Mikayla Fawcett and Justin Bige, as well as other members of the community. Fawcett worked alongside Harwood as her assistant and Bige contributed to the team in research and production. “I have a tendency to get these fully-born ideas that costs thousands and thousands of dollars—and then I go out and fundraise,” says Harwood, about the creation of the artwork. 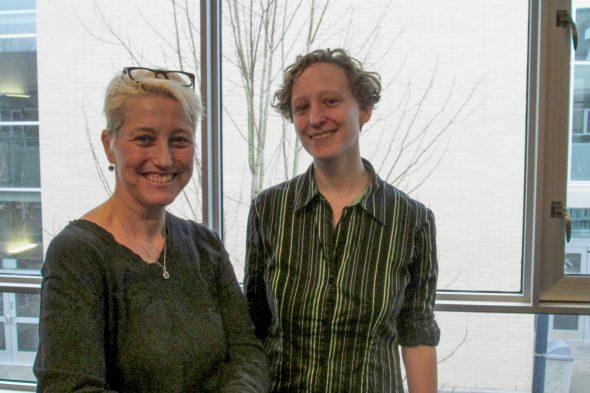 Following its debut, Harwood exhibited her work at KPU on Jan. 25. Surrounded by the 90 individual fabric panels created by the artists and the community members using ancient Shibori indigo dyeing techniques, people walked through the installation in the Surrey Cedar Boardroom and listened to the whispers of women. As part of the project, a three-minute clipping of the vocalists’ work played while everyone in the room sat silently. With her elbows on the desk, Fawcett held her head up in her hands with her eyes closed and let the sounds move her as if hearing them for the first time. Fawcett says that the most memorable moment of working on the project for her was teaching and dyeing fabrics at Emily Carr in Vancouver. She loved the “branching patterns” and “collaborative process” that she was able to create there. According to Fawcett, Harwood’s next project—which she refers to as “the temple series”—will likely revolve around the human relationship to animals. “She’s talking about different forms of exploitation as well as oppression, the different forms that it takes and how it changes our relationships,” says Fawcett.